In-vitro diagnostics market size was valued at USD 62.8 billion in 2017 and is expected to witness growth of around 5.6% CAGR from 2018 to 2024. Increasing prevalence of health acquired infections and growing adoption rate of automated laboratory diagnosis machine will boost IVD market growth over the coming years. As reported in Becker’s Journal, more than 99,000 people die every year due to health acquired infections and out of the total healthcare costs, healthcare acquired infections cost around USD 35 million annually. Also, the journal mentioned that around 5% of the people admitted in the hospitals suffer from health acquired infections that will foster in-vitro diagnostics industry growth. Growing geriatric population that is susceptible to chronic infections such as diarrhoea and tuberculosis should impact positively on business growth. According to Japan Times, as of 2017, in Japan, there are around 2 million people in the age group of 80-90 years and majority of them suffer from chronic diseases. Above-mentioned will escalate the market growth in foreseeable future. IVD market growth can be hampered due to high cost associated with diagnostic devices and procedures that will restrain from availing diagnosis services. Product segment held USD 18.7 billion in the year 2017 due to increasing demand for diagnostic instruments and reagents globally. Growing burden of infectious diseases will upsurge demand for molecular diagnostics kits and reagents that will boost business growth. For instance, in India there were around 2.7 million cases of TB that created hike in the demand for IVD industry thereby surging segmental growth over the forecast timeframe. 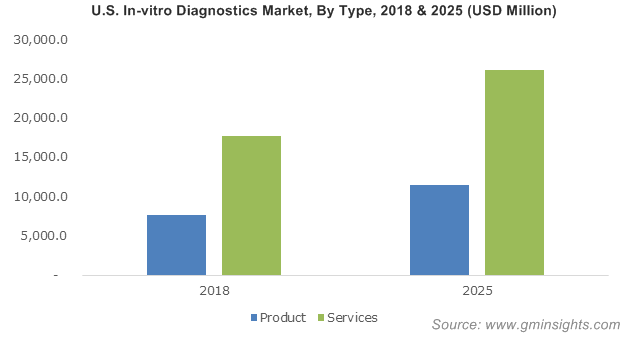 In-vitro diagnostic service type segment will grow at 5.4% during the forecast period as a result of surging number of hospital-acquired infections in developed as well as developing countries. Countries such as India with poor hygiene conditions and high mortality rates will escalate the need for molecular diagnostic services. In India, around 1.4 million people suffer from hospital acquired infections that will increase the demand for service type such as blood gas analysis that should drive in-vitro diagnostics industry growth. Clinical chemistry segment accounted for 20.9% revenue share in 2017 due to wide-ranging applications including detection of blood glucose levels, hormone fluctuations and other. Rising preference of diagnosis for treatment of hormonal disorders will upsurge segmental revenue size during the forecast timeline. For instance, in India, around 1 in 10 people were diagnosed with hormonal disorders in 2017. Moreover, modifications added by the key industry players in diagnostic devices have enhanced its reliability and efficiency thereby should contribute to significant segmental revenue share over the forecast timeframe. Oncology segment held USD 12.6 billion in 2017 as a result of annually rising number of cancer cases. According to Wiley Online Library in 2015, there were around 4.2 million people suffering from cancer in China. Furthermore, availability of superior quality molecular diagnostic tools has reduced the mortality rates due to cancer that will stimulate in-vitro diagnostics industry growth. Hospital segment of IVD market will grow at 4.5% over the forecast timeframe due to increasing hospital admissions annually coupled with high prevalence of chronic diseases among geriatric population. Extended use of molecular diagnostics in the hospitals for detection of various rare diseases proves beneficial for the market growth that should impact positively on business growth. As reported by Global Genes, in U.S. annually, 30 million people suffer from rare diseases that will boost IVD market growth in upcoming future. U.S. market was valued at USD 23.9 billion in 2017 and is expected to grow considerably over the coming years. Growing number of urgent care centres in the country along with rising elderly population will upsurge revenue size. As reported by LabMedica in 2016, there were more than 10,000 urgent care centres increasing the demand for in-vitro diagnostic services in the U.S. These urgent care centres are beneficial and convenient for the patients as they provide primary care facilities for acute illness, injuries and other chronic infections at a reasonable cost thereby, should favour industry growth. 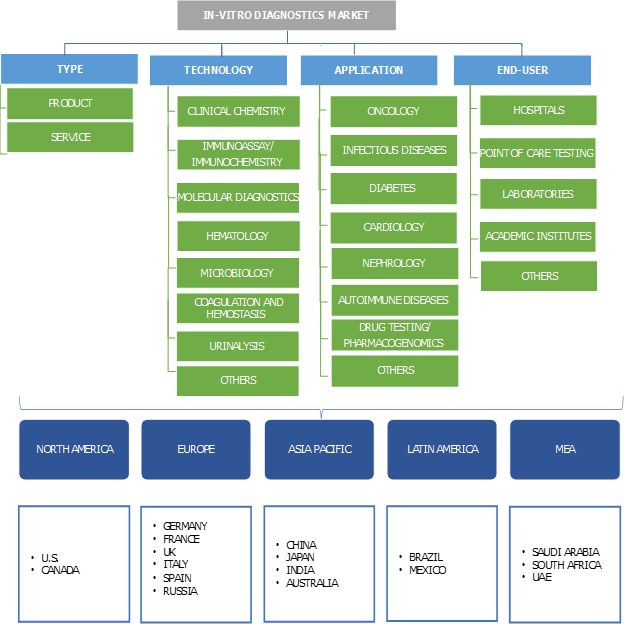 Some of the prominent industry players operating in the in-vitro diagnostics industry are Abbott, Becton Dickinson, BioRad, BioMerieux, Cephied (Danaher), Grifols, Johnson & Johnson, Luminex, LivaNova (Sorin), Ortho Clinical Diagnostics, F. Hoffmann-La Roche, Siemens, Thermo Fisher Scientific, Sysmex Corporation and Qiagen. New product launch, development of new technology within analytical instruments and acquisition are strategies implemented by the companies to increase their market share. For instance, in July 2017, Danaher expanded its clinical flow cytometry portfolio that is possessed by Beckman Coulter. Beckman Coulter is a subsidiary of Danaher and leveraging its expertise will aid revenue generation for Danaher. In-vitro diagnostics industry has witnessed significant developments till today that includes the PCR technique initiated in 1983 by Kary Mullis. Key industry players such as Roche, Thermo Fisher and others focus on integrating technological advancements in the diagnostic devices. This will have a positive impact on industry. In-vitro diagnostics industry is consolidated nature and is solely depended on two factors such as economic potential and adoption rates of diagnostic devices in hospitals and laboratories. Moreover, the industry is still in the development phase and with development of reimbursement scenario, in-vitro diagnostics industry will witness high growth over the coming years.